The girls and leaders from the 1st and 2nd Sparks joined forces last weekend for a Winter Wonderland themed sleepover at a local community hall. For many of the Sparks this was their very first sleepover ever. The leaders were impressed with how well everybody did. The Sparks really took to the spirit of sharing and being a friend, and there were no major problems at all. Even girls who were a little nervous about missing their families and being away from home were so busy having fun and being with their friends that there wasn’t a single melt down, even at bedtime. The winter-themed activities included making their own “toss the snowball through the snowman” games to take home, making snowflake headbands, and watching everyone’s favourite movie (Frozen, of course) on a big screen almost like being at the movie theatre. It was quite spectacular to see 22 Sparks singing along to Let it Go with perfect diction and clarity! 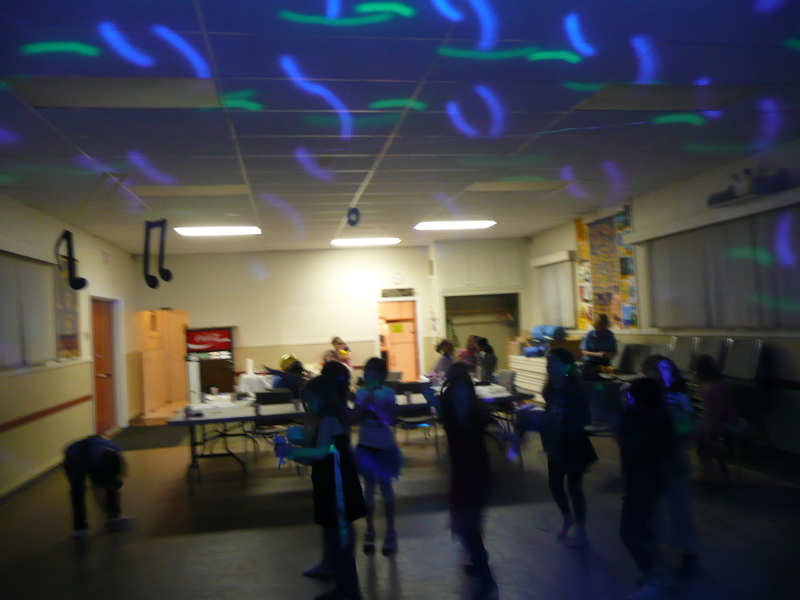 Girls also got to eat yummy pizza, sing their favourite campfire songs, and spend time dancing with a disco light. They even went to bed at a reasonable hour, without very much fuss at all. It was a wonderful night of fun and friendship. This was a very successful first sleepover for these units this year. Both groups look forward to taking their Sparks on more exciting outings, sleepovers, and camps throughout the year. 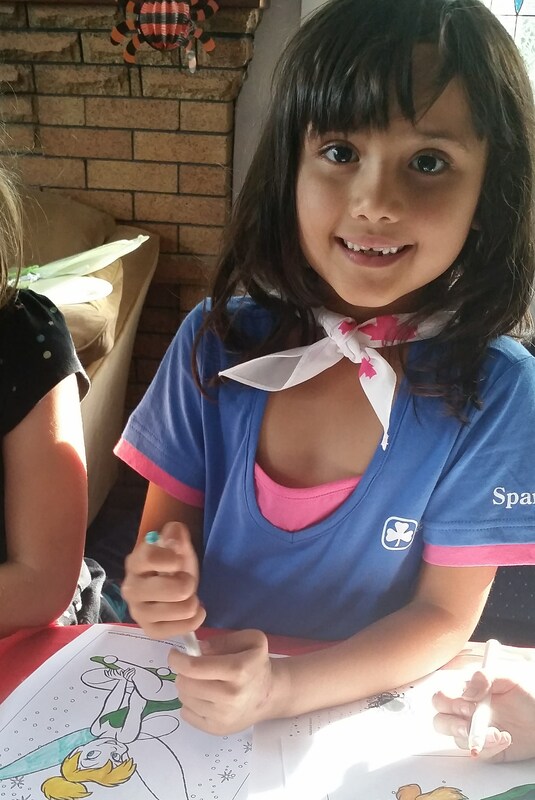 Last week the girls of the 1st Sparks had a great time sleeping over at Richmond Guide House. They had a pizza pajama party with the theme of Tinkerbell! 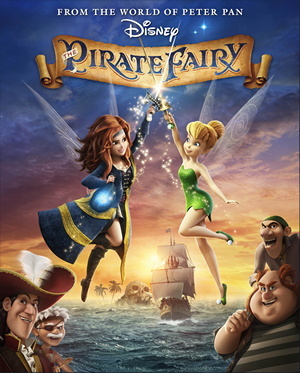 They enjoyed a tasty pizza supper and then did a craft of Tinkerbell tutus before settling in to a room made into a movie theatre with a projector showing the Tinkerbell Pirate Fairy movie on the wall. The movie looked and sounded great. So much fun! In the morning the girls had a fairy party. This involved wearing the tutus made the night before and putting on fairy wings. 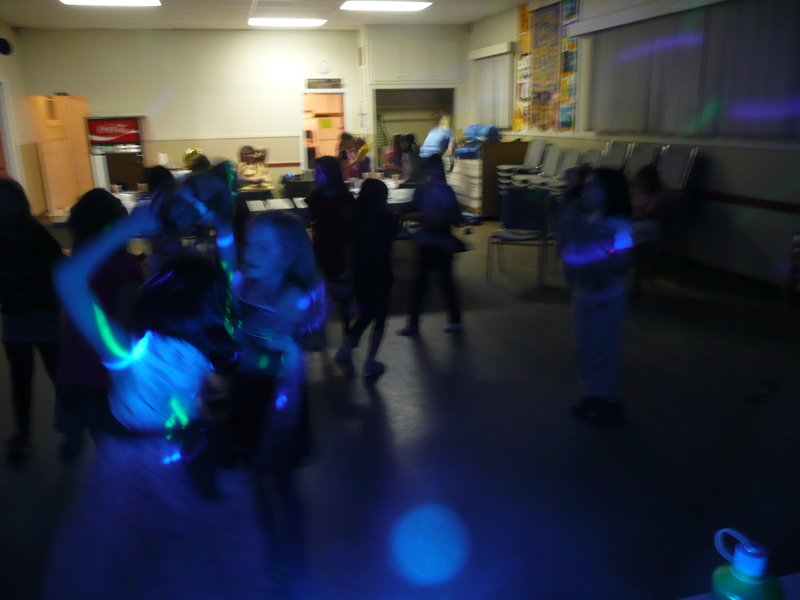 The “movie theatre” room was converted into a “dance party” room with music and disco lights. 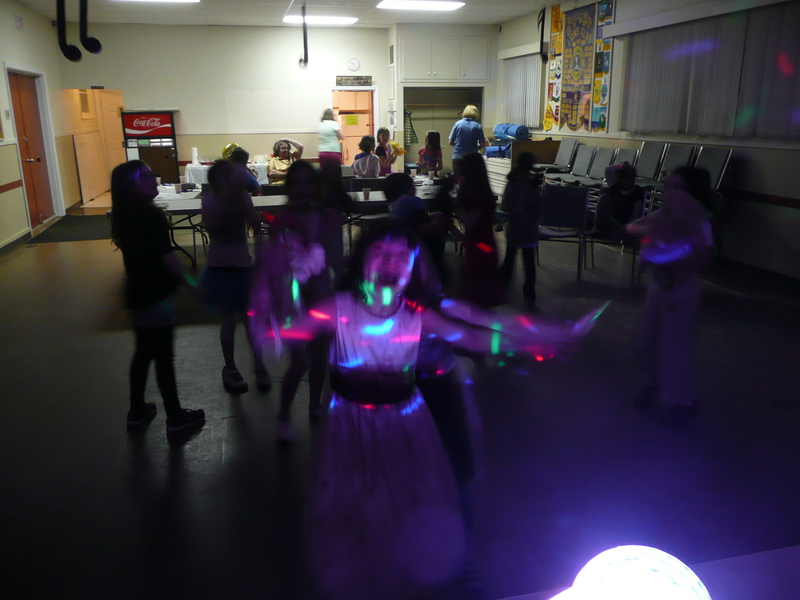 They danced to pop music and classics like the Chicken Dance and the Macarena. The fairy party also included reading from a Tinkerbell picture book, eating cake pops, and colouring some Tink sheets. At the end of the event, some of the girls didn’t even want to go home they were having so much fun. That’s a pretty impressive endorsement considering for many of these Sparks it was their very first sleepover ever! 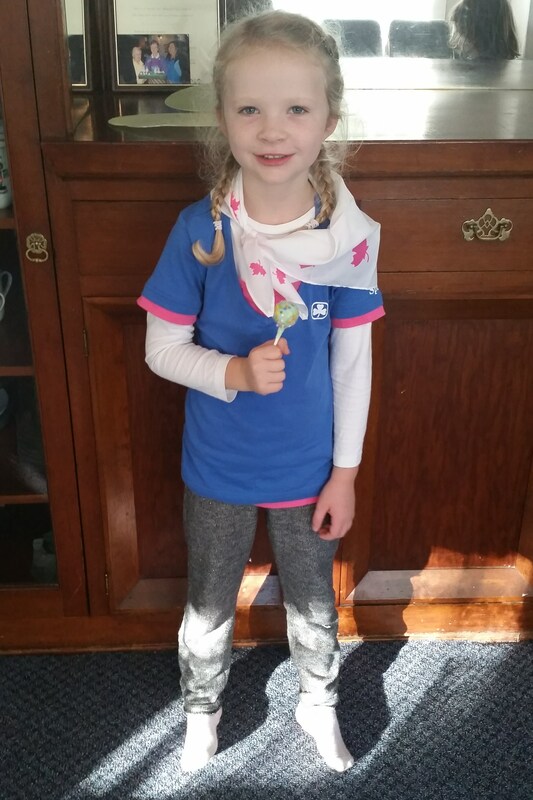 Early in the Guiding year the girls of the 54th Brownies were very clear about one thing that they wanted to do this year. They wanted to have a DANCE PARTY. Brown Owl wasn’t too sure what to make of their request at first, but as they continued to show interest in pop music and making dance routines and singing together during regular meetings, it became clear that this was something they should pursue. So for their second sleepover of the year, the group rented a hall in the community for the night. The leaders decorated with music-themed decorations. The girls made a craft out of recycled CDs. 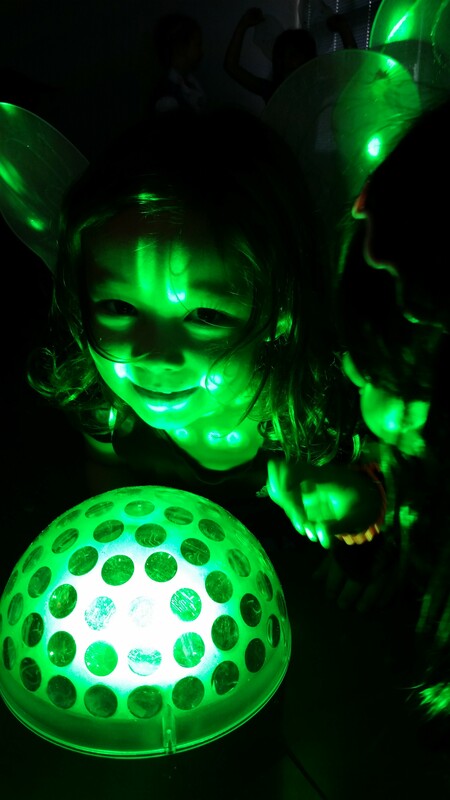 But the biggest hit was the disco light that showed three different colours and kept to the pace of the music that was playing. The girls made dance routines in patrols to some of their favourite pop songs. They also did “traditional” dances like the Chicken Dance, the Macarena, and the YMCA. The danced enthusasitically, even singing along to the chorus of Brown Owl’s favourite song (Bon Jovi’s “Living on a Prayer”) taught to them by some of the other leaders. It was a night of Kelly Clarkson, and Justin Beiber, One Direction, and Taylor Swift, and so many more — and a really fun night that neither the girls nor the leaders are likely to forget. On Monday August 27th, several of the Guiders in our District got together to make some plans and set some goals for the upcoming Guiding year. Quite a lot got accomplished! Plans were made for District events such as Thinking Day and Year End Advancement, as well as Guider training, team-building, communication, and council administration. Lots of great ideas were brainstormed for fun unit activities and bridging opportunities as well. Some new Guiders got to meet more experienced ones, and everybody had a good time. Because we don’t want to do anything as boring as a plain old meeting, this planning session was conducted as a Luau at one of the Guiders’ homes. There were snacks such as mini Hawaiian pizzas, macadamia nut crusted chicken wings, fruit kabobs, and coconut cake. Guiders really got into the spirit of things by wearing flower leis, grass skirts, and even coconut bras! 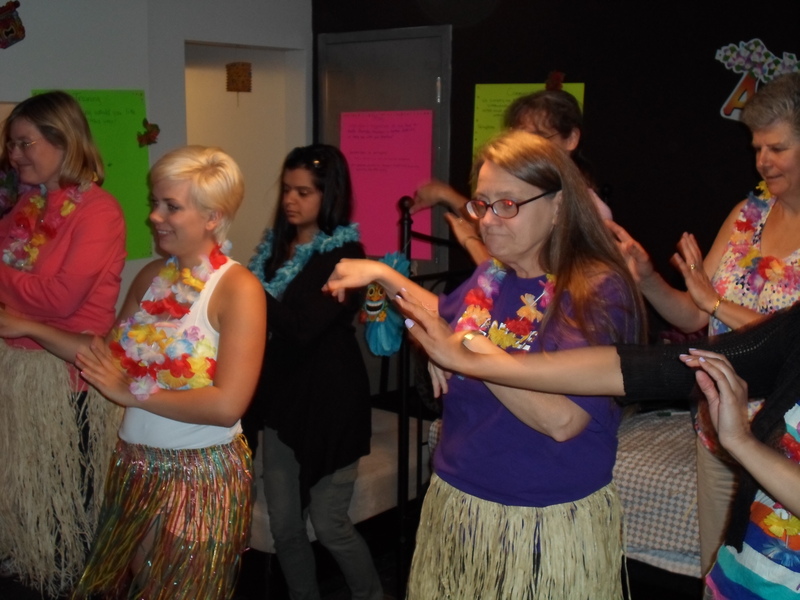 The highlight of the evening was following an online Hula dancing lesson, which involved lots of laughter. Thank you to everyone who made it out to this event. It sounds like we’re all set to have a really exciting year!